King Menkaure | King Menkarue Pyramid | King Menkaure and His Queen. King Menkaure was the son of king Khafre and queen Khamerernebty I. his grandfather was King Khufu. He had many brothers and some of them acted as viziers at the royal court. Their names are Nebemakhet, Nikaure, Iunmin, and Nikaure. 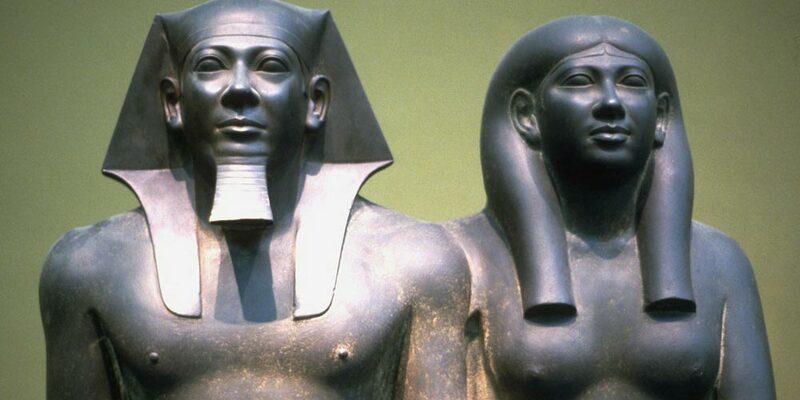 He had two wives, one of them was actually his sister, Khamerernebty II and the other one was his half-sister Rekhetre. He had not many sons including Khuenre, a daughter, Khentkawes, who died at a very young age, Shepsescaf, and Sekhemre. The Pyramid of King Menkaure at Giza was known in the ancient Egyptian language as “Netjer-er-Menkaure“, which means “Menkaure is divine“. It is the smallest one among Giza Pyramids as it measures 103.4 meters at the base and 65.5 meters in height. There are three other attached pyramids to the Pyramid of King Menkaure. They are labeled G-IIIa, G-IIIb, and G-IIIc. Two of these pyramids were left incomplete and there is no reason for this. The one that is completed contains a statue of a queen and his wife Khamerernebty II is buried in one of these three pyramids. The mortuary temple of King Menkaure contains three statues of the Pharaoh and Queen Khamerernebty II with an Egyptian Goddess. These statues are made of pink granite. There is a large stone sarcophagus in the burial chamber of the main pyramid. This large stone is totally made of basalt and contains some hieroglyphics writing. It is about 8 feet long, 3 feet in width, and 2 feet in height. It was removed to the British Museum in London over a ship but the merchant ship was lost after leaving the port in 1838. Note: “Trips in Egypt” always searching for satisfying the needs of Egypt’s travelers, so we provide day trips to Giza pyramids complex which contains the pyramid of King Menkaure and its monuments through Cairo Day trips. This temple is totally made of bricks and contains some statues of king Menkaure with his wives along with statues of deities. His name in Greek was Mycerinus, which means “Eternal like the souls of Re”. King Menkaure ruled during the Old Kingdom after succeeding King Khafre. King Menkaure continued the tradition of building the Pyramids of Khufu & Khafre and built his splendid pyramid, The Pyramid of King Menkeure. He ruled from the Royal Court in Memphis. His viziers, who were actually his sons, played a very important rule in the building projects of the pharaohs. The sun god’s cults threatened the supremacy of the king. Finally, Egypt has lots of gorgeous attractions and archaeological sites in Cairo, Luxor, and Aswan, Alexandria, and Hurghada. So through our Egypt tour packages, you can find the best chance by discovering the ancient places and refresh your soul in a fabulous Nile cruise & enjoy the best beaches on theRed Sea.